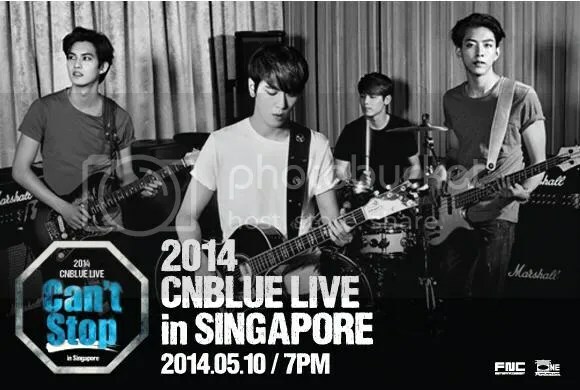 South Korea leading rock boy band, CN Blue will be back in Singapore this May as they embark on their new concert tour “2014 CNBLUE LIVE – Can’t Stop in SINGAPORE“. The quartet is undoubtedly one of the most prominent band in Korea’s music industry. Comprised of lead vocalist and guitarist, Jung Yong Hwa, lead guitarist and vocalist, Lee Jong Hyun, bassist, Lee Jung Shin and drummer Kang Min Hyuk, they debuted in 2010 under FNC Entertainment with the EP “Bluetory”. Since then, they have won countless music awards on South Korea’s music chart shows and they tell fans they can’t be stop with the success of their recently released 5th mini album: Can’t Stop. With a much-anticipated return to Singapore, CNBLUE will present an electrifying performance for “2014 CNBLUE LIVE CAN’T STOP IN SINGAPORE” for a one night only concert on 10 May 2014 at Singapore Indoor Stadium. Don’t miss the chance to catch them LIVE as they belt out songs from their latest album and classic hits! To hype you up, CN Blue has something to say to you!